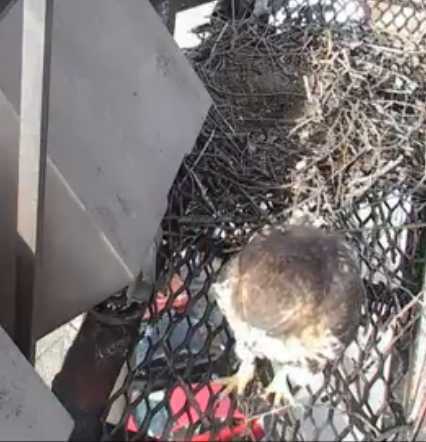 Another video showing the hawk chick. and some pictures, later. There is a pip in the second egg. I saw movement inside. The babies are growing quickly! Three cutie pies. I wanted them all to line up for me but they just wouldn't cooperate. It is with great sadness that we report the passing of one of the #cornellhawks juveniles yesterday afternoon, Tuesday, July 7. Birders-on-the-ground observed the young hawk pursuing a squirrel, and during the pursuit it flew into a window of Rice Hall on the Cornell campus and died from trauma related to the impact. The Cornell University College of Veterinary Medicine Companion Animal Hospital confirmed the hawk had passed away. 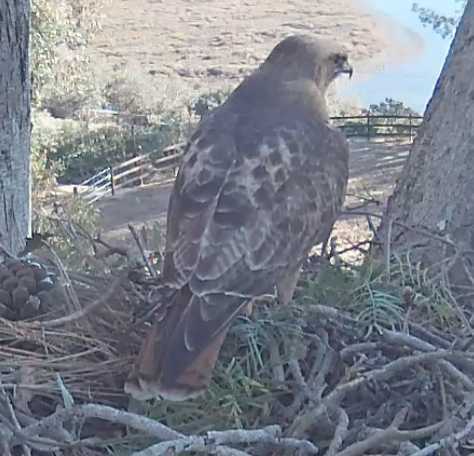 There's no consensus as to the identity of the young hawk, but most think it was either F1 or F2. Surviving the first year of life for most birds is the most difficult year of their lives, and Red-tailed Hawks are no different. Learning to fly, hunt, and migrate successfully is a challenge, and estimates of first year mortality for Red-tails ranges from 50% to over 80%. 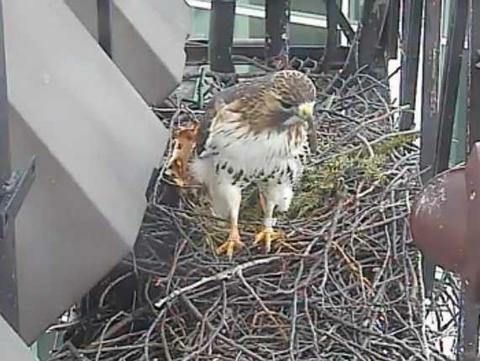 The urban environment offers its own hazards, and these, too, must be mastered to be a successful hawk. While we are saddened about the loss of one of the F's, we are also hopeful that the remaining young continue to grow stronger through the summer and learn from the tutelage of Big Red, Ezra, and each other. Thanks to the Cornell Hawks community for your support at this sad time. Don't know who or where.. I do no know where my viewing time went . used to watch the hawks all the time. Hope all continues well here. I hate it when they hit buildings. 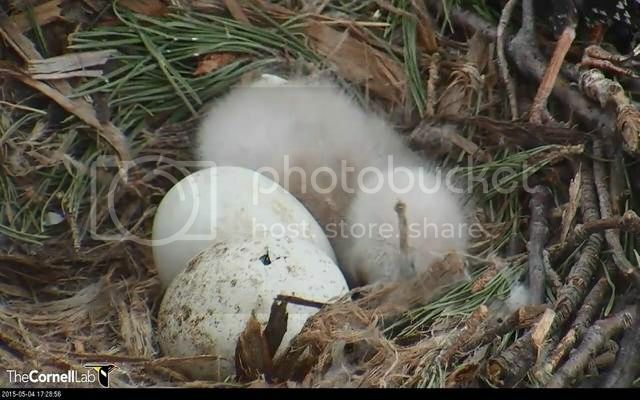 Same camera company that has the Hanover Eagles and Great Horned Owls. 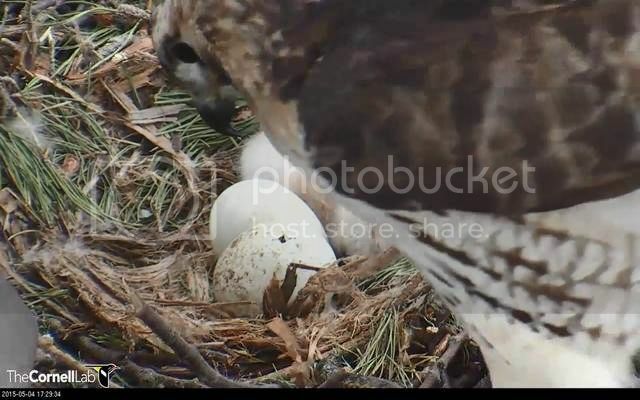 Big Red and Ezra have been seen frequenting the nest site in Ithaca, NY!